From the producers behind the region’s biggest hit shows like The Sound Of Music, Annie and Disney High School Musical comes a spectacular new production of the legendary musical OLIVER! 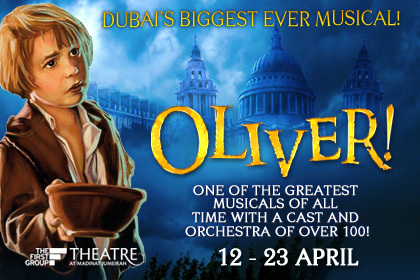 Featuring a stunning set, orchestra and starring a cast of the very best in London’s West End and UAE talent, OLIVER! opens on the 12th April, 2012 at Dubai’s most popular venue, The First Group Theatre, Madinat Jumeirah and will run for fifteen unforgettable performances over two unmissable weeks. Since its first staging almost five decades ago, OLIVER! 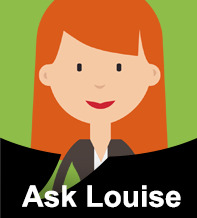 has enjoyed immense success over the years. The first Broadway production won three Tony Awards and the 1968 film version won six Academy Awards, including Best Picture. The production’s magical score is full of Lionel Bart’s irresistible songs including Food Glorious Food, Consider Yourself, You’ve Got to Pick-a-Pocket or Two, I’d Do Anything, As Long As He Needs Me and many more. OLIVER! 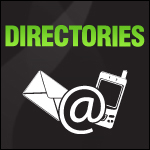 represents unmissable family entertainment at its best. BOX OFFICE NOW OPEN! CLICK HERE TO BOOK NOW! CLOSED: Win Tickets for a Family of Four to Oliver the Musical!